After battling through a long, cold winter, footballers aren’t alone in benefiting from the recent sunny September days. Clubs around the country are installing solar panels to reduce their energy bills and flex their environmental muscle. Given offices, gyms, recovery centres and pools chew through most of their electricity during daylight hours, solar is a perfect fit. Grand Final week is the perfect opportunity to recognise the real AFL heroes – the football clubs taking a punt on solar. 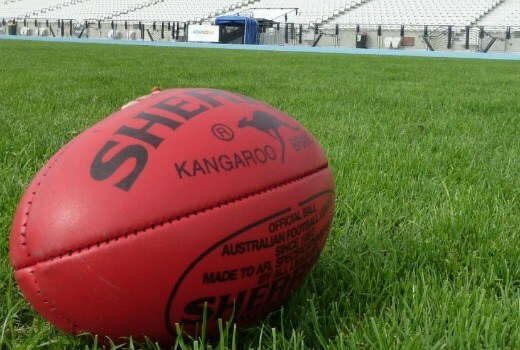 Collingwood and West Coast might be fighting to be Premiers, but other AFL clubs are the champions when it comes to embracing renewable energy. This week as the Eagles and Magpies line up for the Grand Final bird fight, let’s celebrate something we can all get behind. The votes are in, the sun is shining. Here’s to the AFL’s best on ground solar performances. The appropriately named Gold Coast Suns were early adopters, integrating a ‘solar halo’ during construction of their Carrara training base in 2011. The ring of custom made panels circle the top of the stadium, making the most of the sunshine state’s natural advantages with a 200kW punch. In one measure to enhance performance, the Essendon Football Club moved their training base from Windy Hill to the True Value Solar Centre in 2014. As well as sponsoring the football team at the time of the move, the solar installers also installed panels to offset the energy demand from Essendon’s state of the art home base. 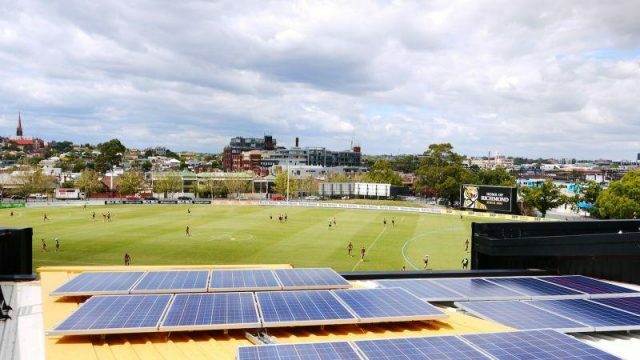 Ousted reigning premiers 2018 Richmond installed a 100kW solar setup on the historic Punt Road Oval grandstand in 2014. The club’s former ‘sustainability partner’ Metro Solar fitted the system, which supplies power to their gym, treatment and recovery clinic, education spaces and offices. In 2016 the Kangaroos grabbed the ball and ran with it, fitting a massive 200kW array to the Arden Street Oval’s two major rooftops. Receiving funding from the Clean Energy Finance Corporation and local council, the 800 panel system was the biggest in the City of Melbourne when installed, reducing the club’s reliance on grid-supplied power by 22 per cent. Fremantle have also seen the light, working with their sponsor Solargain to install a 100kW system on their Cockburn training base. The Docker’s rooftop panels are part of the largest rooftop system in Western Australia – 1MW of photovoltaics have been deployed at the Cockburn Aquatic and Recreation Centre where Fremantle are an ‘anchor’ tenant.